Yep. The hose I never hardly ever use, which is outside next to a basement room that we haven't been using. It was slowing running for... hmmm, I am guessing 5 days!!!! I know. My oldest discovered water in his room last Wednesday, and you guessed it, I spent the rest of my week vacuuming up water, and drying out carpet. Fun times. So my usual rhythm of posting a new project once a week has been upset. Not to worry! I have TWO projects for you this week. 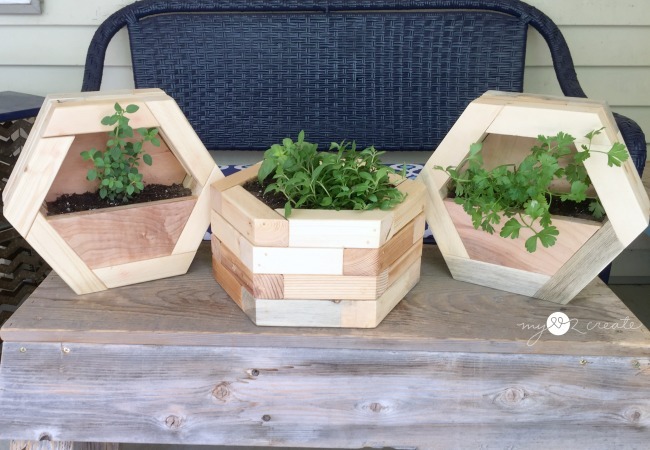 Today's planters and a super fun kid project tomorrow, Yippee! Seriously, I love them. Probably even more because they morphed into the final product without me even planning it. 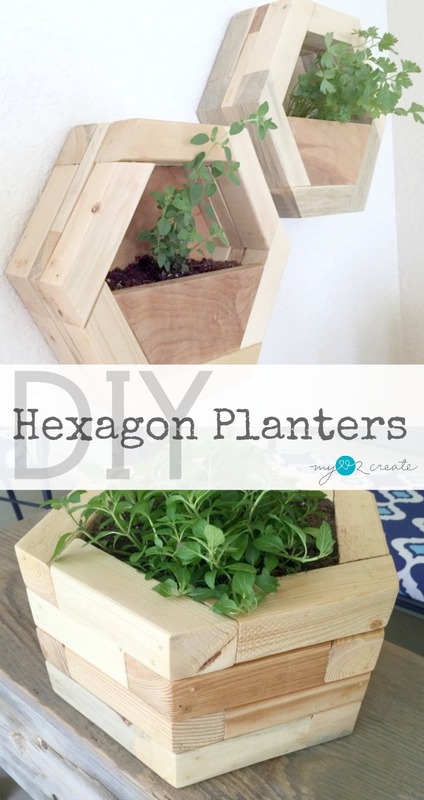 Ok, I DID know I wanted a hexagon planter, but the end result is way better than my original plan! Love it when that happens. I started playing around with the pieces and ended up with this! 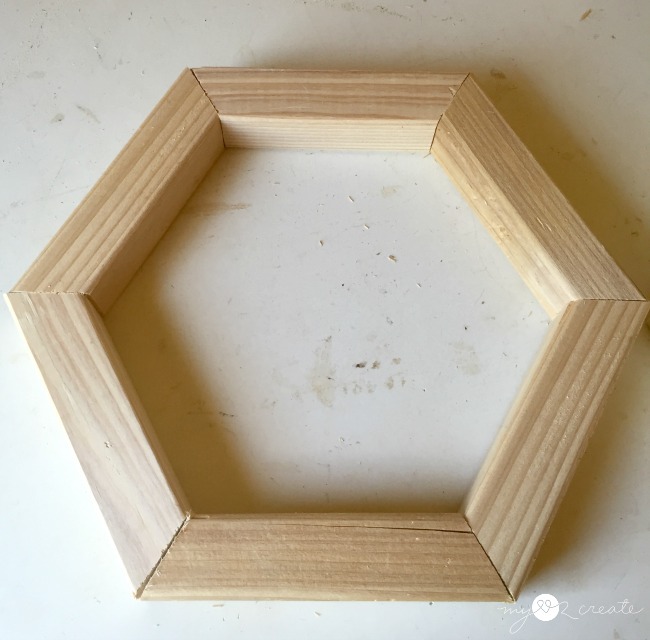 This is different wood then the first example, but the pieces are cut exactly the same, just configured differently, and it still makes a hexagon. How cool is that!? 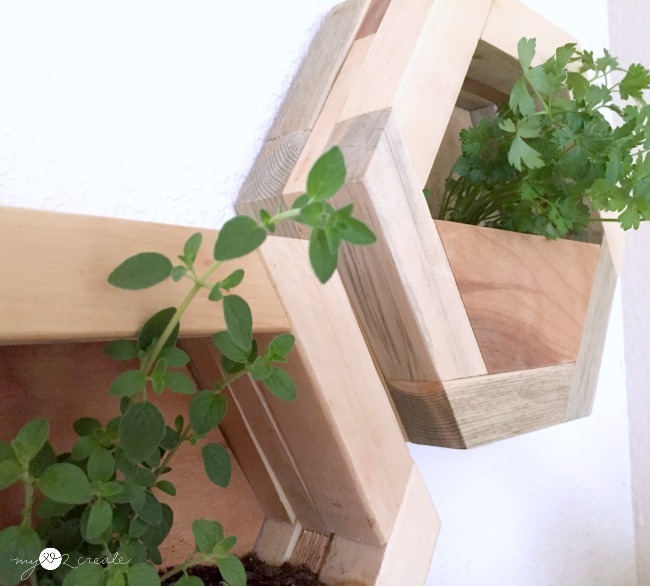 You could make your hexagon either way and stack them to make your planters...if you choose the first way, your opening will be a little bigger. I went ahead and wrote up some basic plans for measurements so you will want to click on them for reference. I will not include all the measurements in this tutorial, just visual and helpful tips. 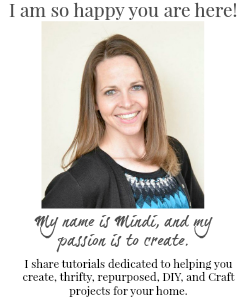 For PDF plans click Here! I made my planters with scrap wood. 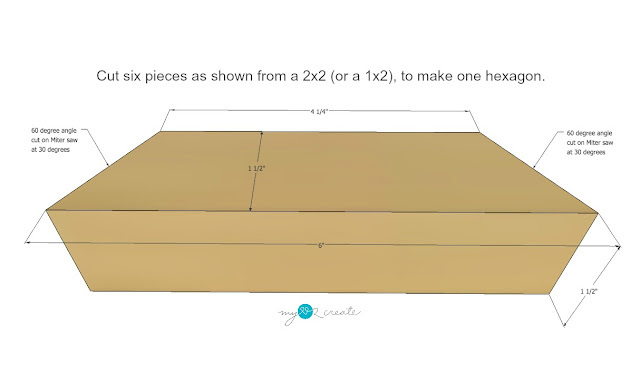 Cut your 2x2's (and optional 1x2) pieces at 30 degrees on each end, ends NOT parallel, with the long side measuring 6 inches. The actual angle is 60 degrees, but because the saw is at 90 degrees you have to cut at 30 degrees to get a 60 degree angle...I know it is confusing...just trust me on this. Mmkay? I cut all my scrap pieces on one side at 30 degrees first (not pictured). 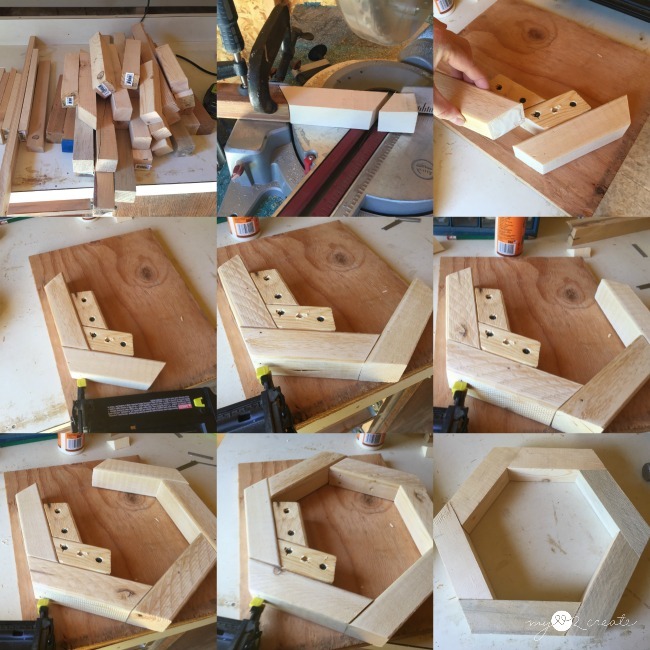 Then I used a scrap piece cut at 30 degrees and set it up as a stop on my miter saw (top middle photo), then I cut the other side of each piece, so that the long side was at 6''. This stop was awesome and only took a few seconds to set up. 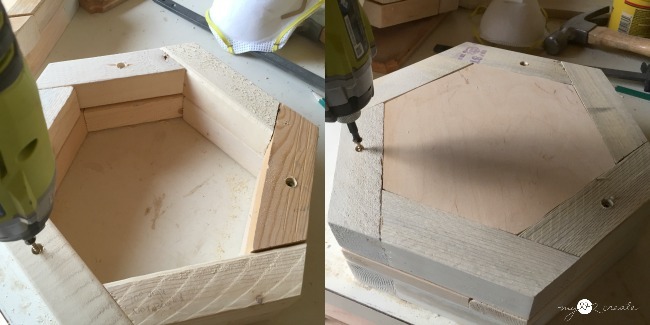 You can see above I made myself a jig for building my hexagons accurately and quickly. 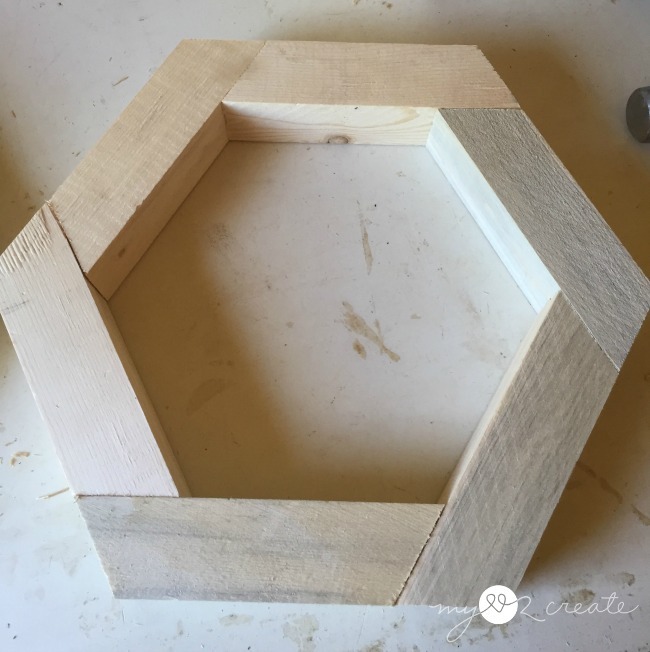 I simply cut some scraps at 30 degrees and put them together just like I was building a hexagon and screwed them to a scrap piece of plywood. Since I was making so many hexagons this was totally worth it. I tried lining up the pieces without the jig and they were always off. When I used the jig I had no problems! 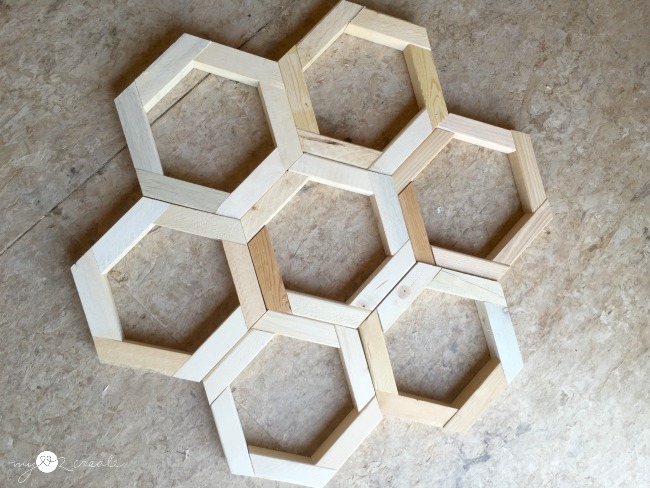 To build my hexagons I glued and nailed on one piece at a time, using wood glue and 2'' finish nails. With the jig as my guide, I worked my way around until I had a completed hexagon. *Tip: Notice that the long side of each hexagon piece is on the inside...it can get confusing and this will help! Before I built my planters I had fun making shapes with my hexagons. :) I actually posted this the other day on Instagram, be sure to follow me for sneak peeks and updates! 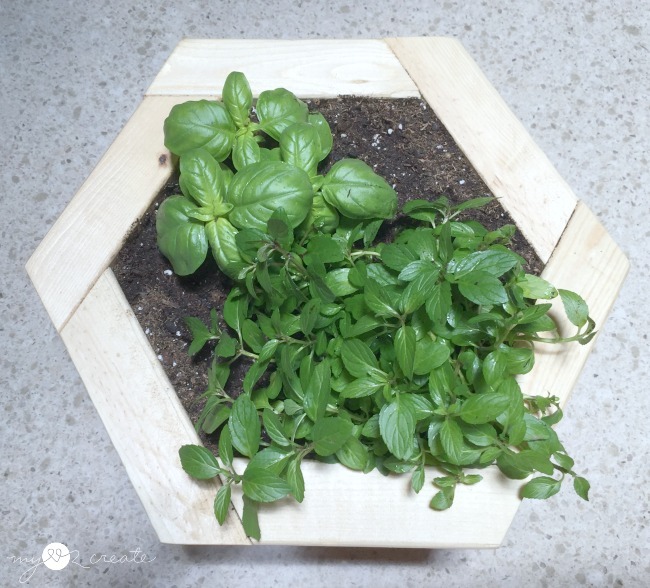 I grabbed some scrap plywood and traced my hexagon onto it to make a bottom for my planter. Then I cut it out on my jigsaw and placed it inside the hexagon. I secured it with 2'' nails from the outside. After I attached the bottoms I realized that I could make a planter that could hang if I added half the amount of plywood to a front piece. This was a fun moment, so I started experimenting and I liked it, a lot. I attached the front piece the same way as the bottom, except the plywood is flush to the front, no the back. 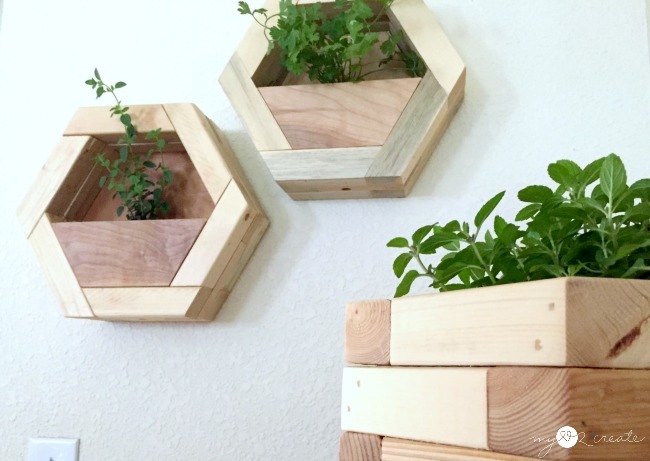 I tried all sorts of different combos, and eventually decided to add a 1x2 hexagon in the middle of two 2x2 hexagons to make my hanging planters. I also made my stacked planter with 4-2x2's attached together. To connect them put the top piece face down and then add the second hexagon on top. Countersink three screws into three sides. Then add the next piece on top and countersink the screws into the other three sides. Alternate the sides you screw into each time. You could stack it as high as you want! Make some taller, some shorter...this is so much fun!! Here all my drainage holes all drilled. 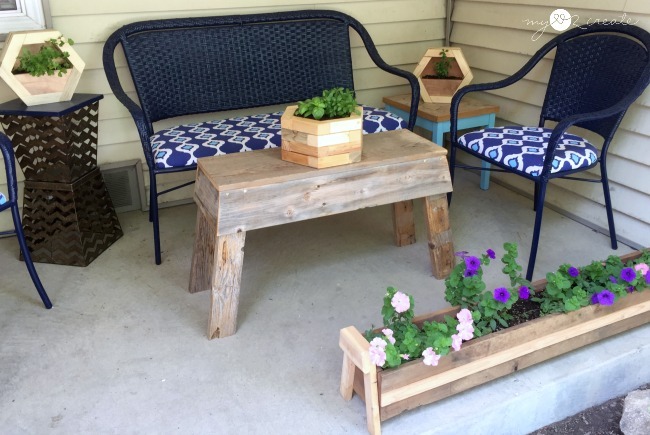 I ended up finishing the outside of my planters with Natural Minwax stain. Then sealed it with a few coats of poly. I love the natural look of the scrap wood, which is why I went with that stain. 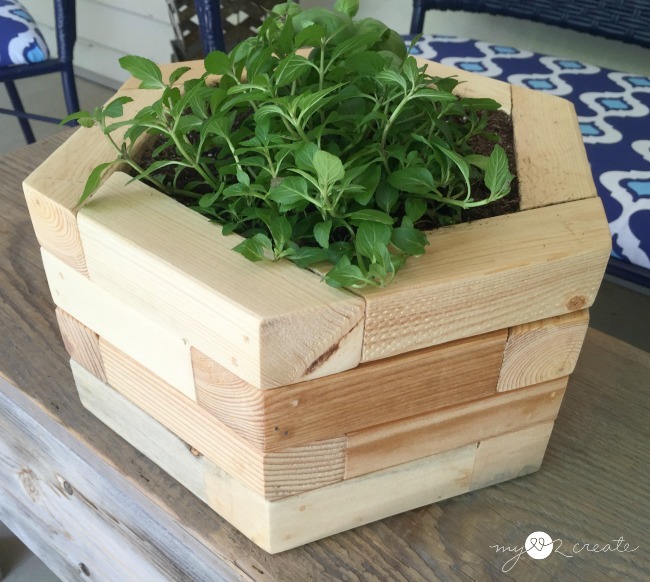 Next I headed to my awesome Potting Bench from Repurposed Shutters and Desk to plant my herbs into my new hexagon planters! I can't believe how happy they make me! 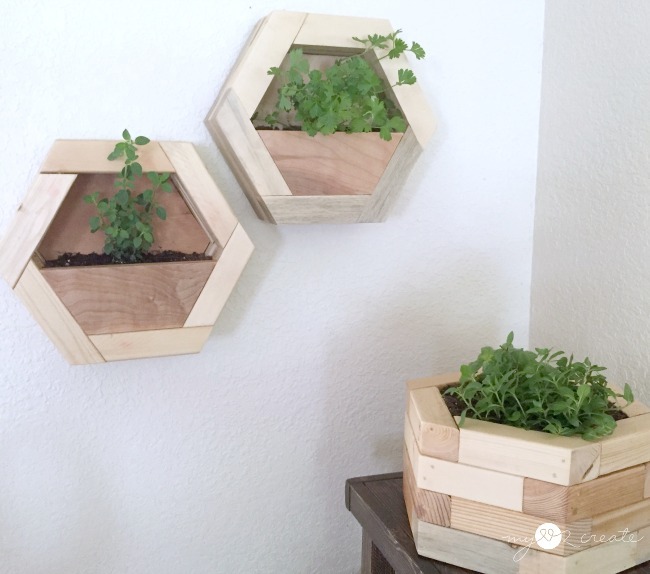 I recently made a hanging hexagon planter for my bedroom, and have been enjoying it. 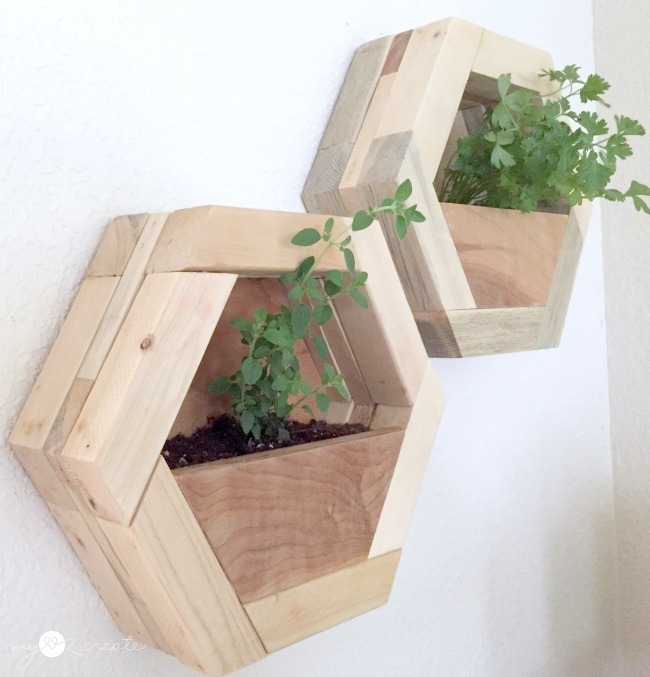 That is why I thought to make some planters for my kitchen herbs with hexagons. I didn't even think of having some of them hang until I was building them and that idea came to me...so sometimes it is good to shoot from the hip! 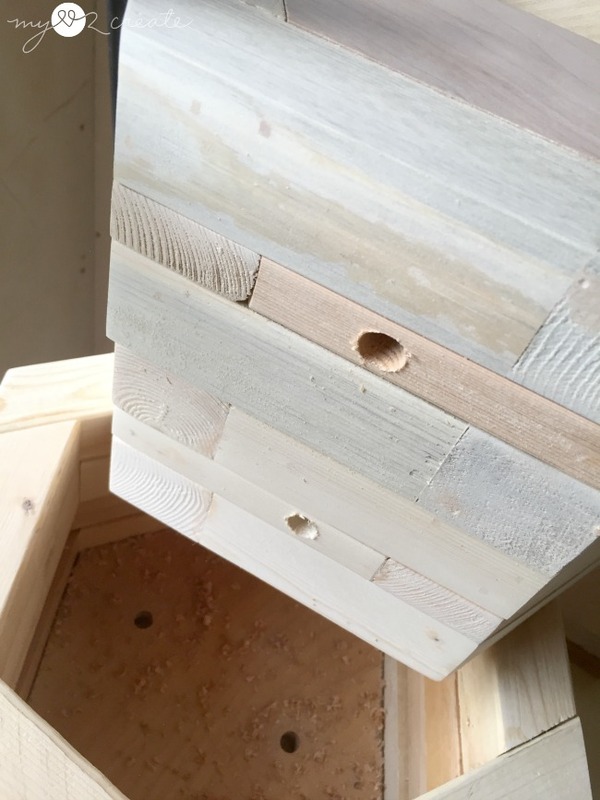 I love the way the wood connects to make the hexagon, it is so pretty. 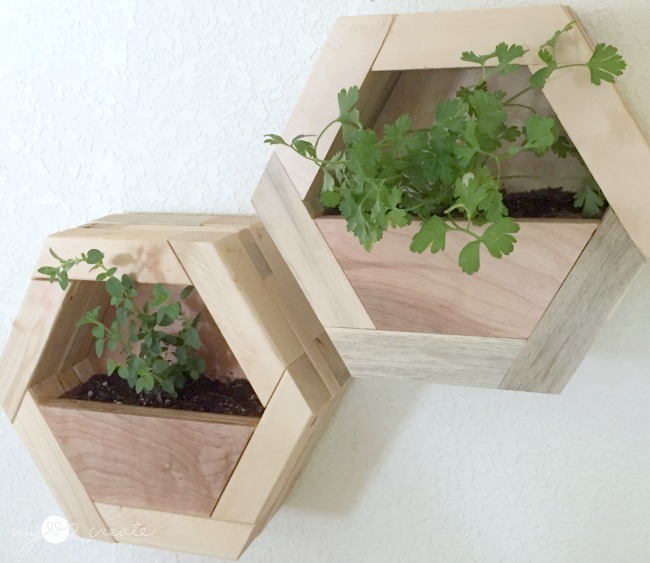 Not only can the hanging hexagon planter go on the wall, they also stand up great too! I took some shots on my porch before I brought them inside. Planted in some dang cute planters. My kids are so funny, they were asking if they could eat some of them. Check out my YouTube Video and be sure to subscribe!! Now, I have another fun treat for you! 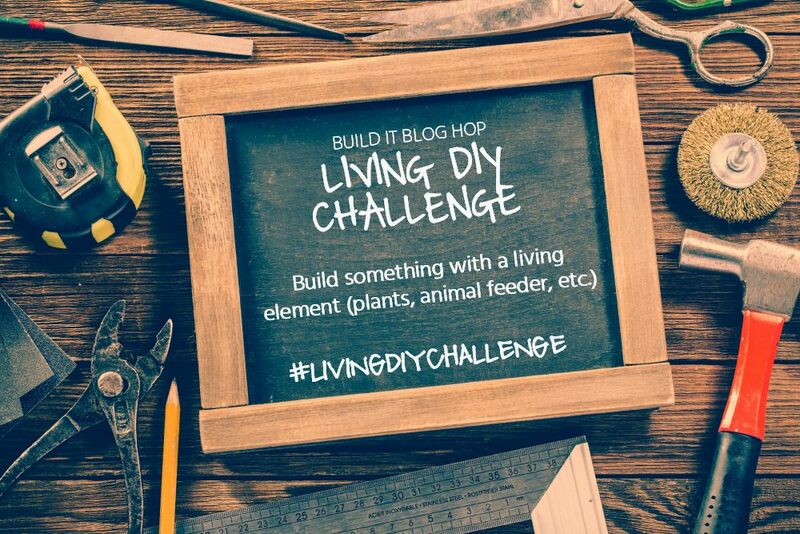 My friend Sarah at The Ugly Duckling House is hosting a Living DIY Challenge and a link up! I can't wait to see what you have to share! And don't forget to come back tomorrow for a "sweet treat"! hee hee! I am so Punny, you will have to wait to see why! Muhahaha! Thanks for the great inspiration. I got to work on hexagon mini catch all wall storage pieces for my entry as soon as I got home last night, only sanding and painting left... I will link them up once I am done. so happy with them, thanks again for the inspiration! I love these planters! Thanks so much for sharing your project at The Creative Exchange. 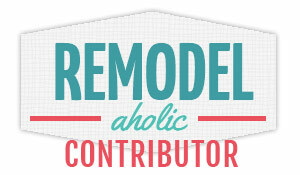 We will be featuring your project this week. Your projects always amaze me. I love your planters! What a project, right?! I love the way they hang up ~ super cool! Those are so much fun! They're a great mix of modern and rustic. Love! Got to try these, love the look !!! They are simply beautiful! Love em! Thank you! Yes I highly recommend a good liner to protect the wood. I got so excited to build them I forgot to include one!